Roof ice | XYNYTH Manufacturing Corp.
No, that is not the sound of reindeer on your roof making an extra stop on their way back to the North Pole. That creaking sound may be sign your roof has too much weight from snow and ice on it. We are often asked by customers if our products are safe to use on their roof. The answer is yes. Products like Mountain Organic Natural™ Icemelter & GroundWorks Natural™ Icemelter are both safe to use on most roofs. Some key points to keep in mind when deciding which product to use are to consider where the melted run off will going. If the run off will be going into plants & vegetation, concrete, or an area where children or pets are, you will want to use a safe, proven, and effective product such as our GroundWorks Natural™ Icemelter If sensitive metal is at risk of corrosion, then using a chloride free product like Winter Warrior Runway Control® is an ideal product to use. 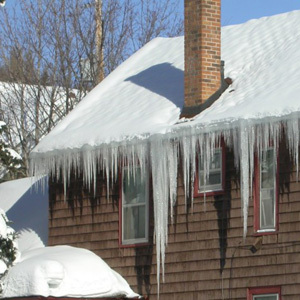 For more info on how to apply the product and some important tips, please see this article – ICE DAMS & ROOFS – in the XYNYTH Ice Melt Resource Center.